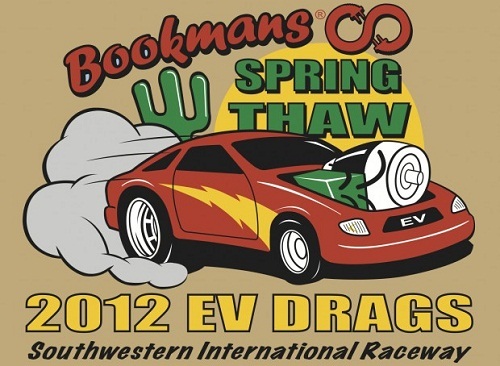 Saturday, April 14th will be the first annual Bookman's Spring Thaw electric vehicle drag races, kicking off a new season of EV racing in the U.S. Racing is often how new technologies and ideas in automotive get tested before becoming mainstream. Few things are as exciting as a good race with squealing tires and screaming fans. In the genre of electric vehicles, drag racing - which is all about torque - is where the EV can really shine. This year, the new season of electric racing begins at Bookman's Spring Thaw in Tucson, Arizona on Saturday, April 14. The Southwestern International Raceway will be alive with show cars, excited fans, and silent motors turning smoking, squealing tires. The hottest names in EV racing will all be there. Race fans will be able to feast their eyes on the pure power of dragster motorcycles like current record holder Lawless, built on an episode of American Chopper and its rival, the venerable KillaCycle that started the EV dragster motorcycle events. Other contenders include Brian Johnson on his ultra-cool racer and the themed machine, Predator, ridden by Jeff Disinger. The iconic White Zombie dragster is an unlikely Datsun conversion gone horribly right as it pumps 355 volts into its custom-built "Siamese 9" motor for a mind-numbing display of raw power in such a small, unassuming car. John "Plasma Boy" Wayland will have the Zombie in Tucson to wow the crowds. He'll be pitted against rivals like the DC Plasma, a Ferrari conversion, as well as the Black Pearl, built by students at Miramar High School. Of course, the Smoke Screen by Denis Berube will also be there to take on the competition, as will his tiny Current Eliminator. Show vehicles from the likes of Roderick Wilde will be there too. Wilde may be the most well-known name in EV build and conversion circles with some great contraptions to his credit, like the Electric Tandem, a tandem bicycle built from a 1970s Motobecane. Other show cars will include the E-Flux, a DeLorean conversion (which will also be racing), and appearances by celebrities in EV like Otmar Edenboech (Zilla Controller developer) and Eva Hakansson of KillaCycle Racing who currently holds records from multiple motorcycle genres. This will be an exciting kickoff even for this year's record-breaking season of electric racing. It's a sanctioned event of the National Electric Drag Racing Association (NEDRA) and you can find out more about it by going to the Spring Thaw page here. This is AWESOME !!! To se Electric catch on in racing.. A couple of things I see missing are posting of times. We all know how important it is to know the times in drag racing. Links to the people mentioned, and of pictures. I can't wait to see Electrics go head to head against ICEs !! You can see times on their page (linked above), but most of the racers/cars/etc. are either in multiple events or will be there all day anyway (or both). The limitations of the way TorqueNews is set up means embedding photos in articles is nearly impossible.